Learn how to cure, or season, your new molcajete, and how to cook with one. It is great for making traditional authentic sauces, salsas, guacamole and so much more. Serve right out of your molcajete, and did you know you can cook with it also? Cooking is an art. When you first learn to cook, it’s a bit different, especially when you don’t have a teacher standing over you. You follow recipes step by step at first, stumbling along the way, until one day you pick up methods and begin to alter recipes, then create your own. Soon after, you’ll start to realize you need more tools in the kitchen to make things a little easier. Or better. Behold the molcajete. For me, the molcajete was one of those kitchen tools I didn’t realize I needed until I saw one. I had been making salsas and guacamoles like crazy and as I learned more about more traditional Mexican cooking, the molcajete made itself known to me, a pure revelation. And I needed one! A molcajete is a Mexican version of the mortar and pestle. It’s a 3-legged bowl that looks sort of like a squat animal carved from basalt, a volcanic rock. Sometimes it even sports a head like a pig to enhance the animal effect. You may have seen them in Mexican restaurants. The pestle is also carved from the same rock and is called the tejolote. If you’re lucky and have had a molcajete passed down to you from a previous generation, you won’t need to season your molcajete. It will already be seasoned from years and years of use, which is a great thing because the molcajete will pick up flavors over time, which enhances the flavor of the foods you are working with. But, if you’re like the rest of us and have had to purchase the molcajete new, you’ll need to cure, or season, it first. It will take at least a day, so please resist the urge to jump into making salsas immediately. This process is important, as it is sanding the interior of the mortar and will reduce the amount of grit that releases from the volcanic rock during use in your recipes. You don’t want the grit! Wash the molcajete with water then clean with a wire brush. Use the pestle to grind up several cloves of garlic into a paste. Spread it all around the inside of the mortar. You can also use onion, or a combination of onion and garlic, as well as cumin seeds, rock salt, cilantro. Rice is another traditionally used ingredient for grinding during this initial stage. Let the molcajete rest 24 hours. Rinse away the paste from the molcajete. Clean the molcajete with water. Mash a paste of garlic, onion and oil into the mortar with the pestle, as above. Make sure to cover all the pores on the inner mortar. Bake the molcajete at 300 degrees for 30 minutes. Fill it with water, vinegar and salt, then bring it to a boil directly over your burner or on a grill burner. Boil out the liquids completely and allow to cool. Grind in dry, uncooked rice to cover any leftover pores. 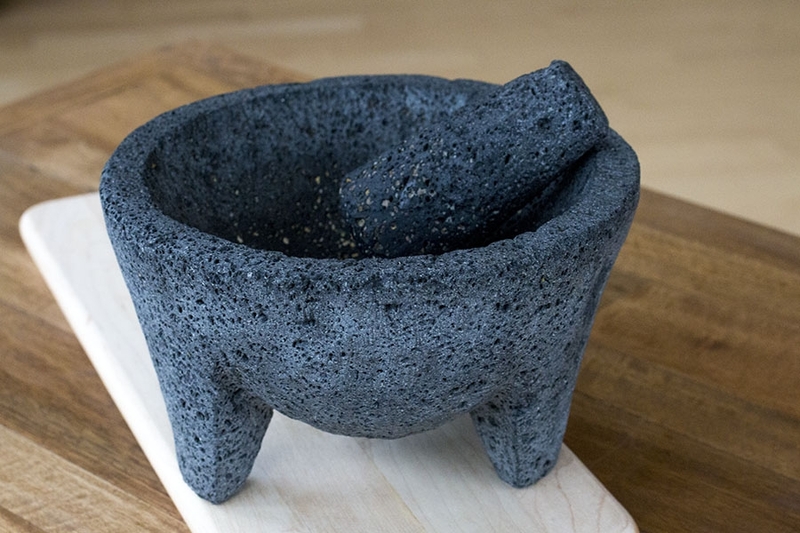 Before using your molcajete for the first time, grind up some thick sea salt along with crushed corn in the mortar until the material comes out clean and free of debris. Clean the molcajete with water and a brush and you should be good to go. Most of these instructions are based on the instructions from the manufacturer of the molcajete. I have found that it is better to repeat the process a few times to really cure the tool. It does take extra time for you, but it will be worth it in the long run. Use your molcajete for crushing and grinding spices, making salsas and guacamole, sauces and more. 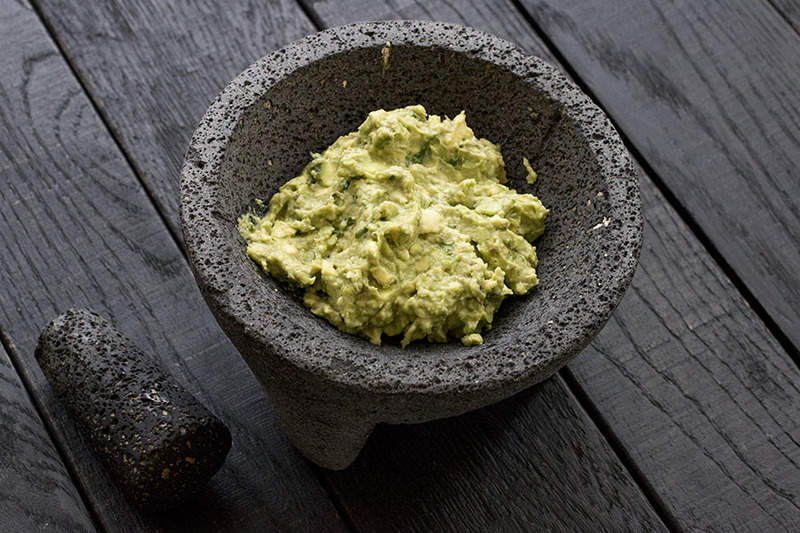 Simply grind down the ingredients in the mortar with the pestle to the consistency you want to achieve and transfer them to a serving bowl, or serve them directly from the molcajete for effect. I love to make guacamole with my molcajete. Here is one of my favorite recipes for guacamole. You can also heat your molcajete, and it heats rather well. It can be used for cooking this way. Heat it in the oven or over an open flame, or even over hot coals, and use as desired. Try cooking shrimp or seafood with your molcajete, or make some interesting soups. Now it’s time to get creative! You will achieve a texture and flavor with the molcajete that you just can’t get with a blender or food processor. I still use my blenders for many recipes, but if you have the time and inclination, use the molcajete for awesome results. Looking to purchase a molcajete? Here is one I recommend. It is the one I have. How do you save a molcajete after it’s been accidentally cleaned with soap?? Julia, I would soak the molcajete to get the soap out of it. Then, grind in some fresh onion and garlic back into it, then bake it a bit. Sort of a re-cure. It can definitely be saved. I just found a molcajete bowl while cleaning out a garage. It is filthy, but I would really love to use it. Can you please recommend the best way (that you know how) to clean it? Thanks! Drew, I would use a wire brush to clean out all of the particulate that may have accumulated in the pores, rinse it, soak it, and repeat until it is completely cleaned. Let me know how it works out for you. Yes, sir! Glad to help. Enjoy!